Almost every couple faces a now what?” moment as their last kid moves out of the house. There’s a big empty nest looming over this new and uncertain stage in their lives. 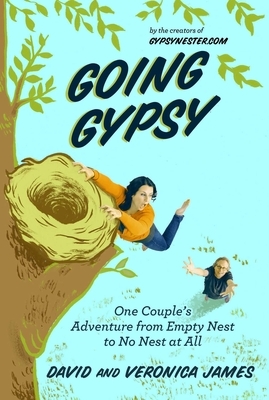 Filled with a sense of adventure and humor, Going Gypsy is the story of a life after raising kids that is a celebration of new experiences. Pulling the rip cord on the daily grind, David and Veronica throw caution to the wind, quit their jobs, sell their house, put on their vagabond shoes, and go gypsy in a beat-up old RV found on eBay. Veronica James was born and raised in Southern California and was like, totally, a Valley Girl. Against any sane person’s better judgment, she ran off with a musician at age eighteen. After procreating, she became Earth Mama, then Helicopter Mom, hovering over every detail of her children’s lives. She and her husband are the creators of the popular website GypsyNester.com. Veronica has held approximately thirty-three different jobs including writer. She is never bored.